Forty fresh ingredients faced us down in chef Iliana de la Vega's El Naranjo restaurant kitchen. Fat emerald green chiles, voluptuous tomatoes and snow-white onions stood in pyramids in green-glazed dishes. Garnet-colored dried ancho chiles and green chiles poblanos filled pottery bowls. Then there were lime-green tomatillos, pecans, sesame seeds and blocks of Oaxacan cheese, fat cinnamon sticks and umpteen fresh herbs. All of these would be combined to form a Mexican staple: Mole sauce. 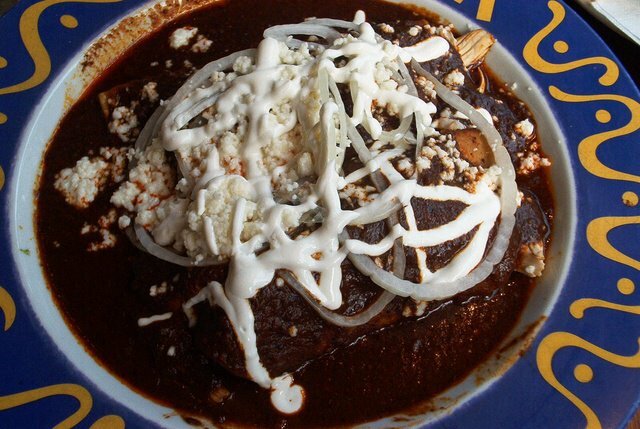 Mole (say "MOE-lay") is a culinary hybrid that combines ancient Mexican ingredients such as chile, chocolate and pecans with the tomatoes, garlic and spices that the Spaniards brought to Mexico. We get the process and even a recipe for the sauce which is often "principal dish of a meal, while the meat serves a supporting role." So much fun for me to see my article on your blog¡ Hope your readers enjoyed it.